​We would like to welcome you and your family to our High Holiday Services for the upcoming Jewish New Year of 5779. At Chabad Jewish Centre all are welcome, regardless of affiliation or background. There is currently construction work taking place in the parking lot. If the front door is not accessible, please use our back door - first back door to the left of the building. For our Pre Rosh Hashana kids fun day click here. 7:00 PM - ﻿Community Dinner & Shofar blowing. more info and RSVP here. 8:05 PM - Fast Ends. Refreshments will be served. No membership fees or tickets required to attend services. Please consider making a donation to help cover the costs. Donations can be made in memory of a loved one or in honour of a special person. RSVP is not mandatory but much appreciated to enable us to accommodate everyone. Refreshments will be served following services. At Chabad all are welcome regardless of affiliation and background. 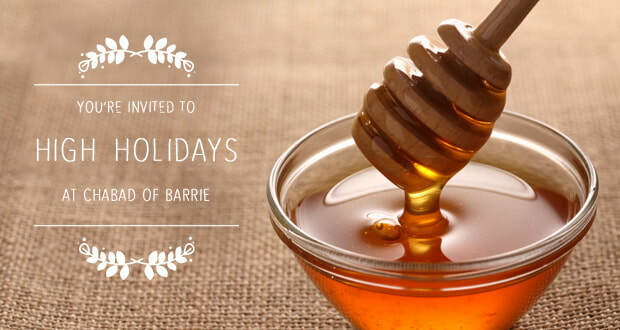 ​Click here for High Holiday services in Bradford. Best wishes for a Good & Sweet new year!